Hawk first studied drum making, in 1987, with Northwest Coast drum-maker, Jim Hickey. 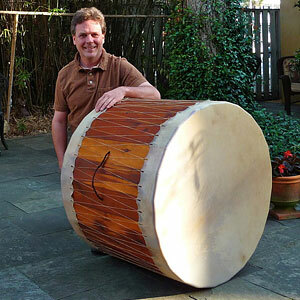 Jim learned to tie this style of drum from the First Nations people of British Columbia. The sound that resonates from these authentic-style, ceremonial drums is absolutely wonderful. Hawk has made several different styles of drums over the past two decades, but has found that the method of tying used on these Northwest Coast style-drums, is the only one which will keep a drum tight for many years. The photos show both the round hoops and the 16-sided frames, as well as, how the skin is bound to the frame. 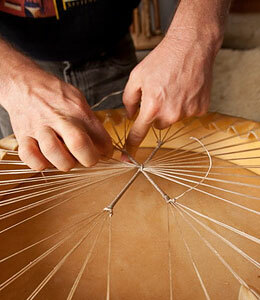 The round frames are made from either Spruce or Maple and will range in diameter from 15” to 17”. The 16-sided frames are made from Western Red Cedar and will range in diameter from 15” to 17”. The skins used will be from either Elk or Cow, depending on what is currently available. 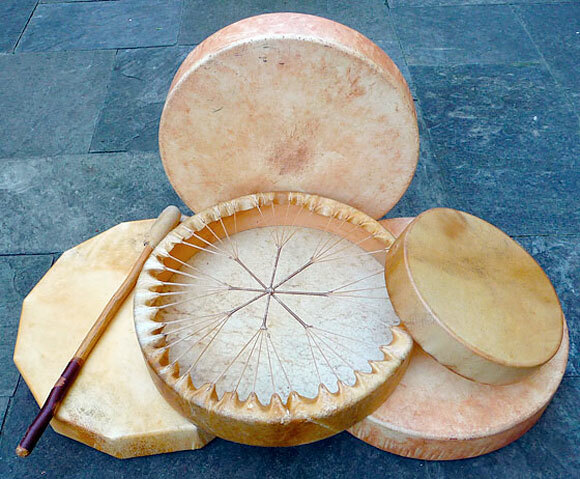 Smaller drums are also available, and (10” diameter) are perfect for children or for travel. 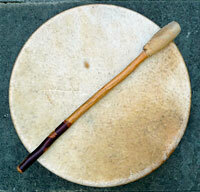 A drum beater with a rivercane handle, deerskin leather, and sheep’s wool stuffing, is included with each drum purchase. 1) Using a pencil, draw your design onto the surface of the dried rawhide (skin). 2) Take a sopping wet, bath towel and cover the entire area of the drum you wish to paint upon (over your drawings). Let sit for two hours, or until skin is wet. 3) Using high-quality acrylic paints, set to work painting your drum. If you do not like what you are doing, it should be possible to run water over the area to remove any acrylic BEFORE IT DRYS. 4) Check to be sure your drum is completely dry (usually 48 hours) before playing. Drum prices may vary, but generally for a 15”-17" frame/hoop, headed with elk or cow skin, the cost will range between $185 - $210, plus shipping. Please contact me, prior to placing your order, to verify current availability of drum making materials, exact price, and/or to discuss any questions or special requests that you might have. Please allow up to 3 weeks for delivery. PAYMENT: You may submit payment by using my PAYPAL account or by sending a check or money order, in the full amount. Add $30 for US shipping. No international orders for drums! Details will be provided once you contact me with your request.